I hope we all decide to use this same joke for this prompt. 2017. Adobe Photoshop CS6; Wacom Cintiq 22HD; Original is 1563 x 1834 px. Abby has had enough of this nonsense. She stands up, strides over to her friend and towers over Holtz at her desk. Holtz continues to make noises like an affronted cat, unperturbed. The engineer roughly erases part of the schematic she’s working on and her noises get louder. “Holtz, would you stop with the damn noises and tell me what the hell is wrong?” Abby huffs. Holtz lets out a groan and flings herself onto the desk, arms out in front of her. Abby takes a seat across from her, preparing herself for some Lesbian Drama. God, she hates the Lesbian Drama. She thought she was free from it when her two best friends finally stopped their weird little courtship ritual and got together two years ago. She had not accounted for the Gilbert-Holtzmann eternal emotional constipation variable. “No! She is! I asked her if I could make proton swords for us and we’d be sword girlfriends and she asked if we died using them did we get to go to Gal-Palla. GAL. PAL. A. Abby, she’s perfect and I love her so much!” Holtz laments. Abby tries not to let her eye twitch. 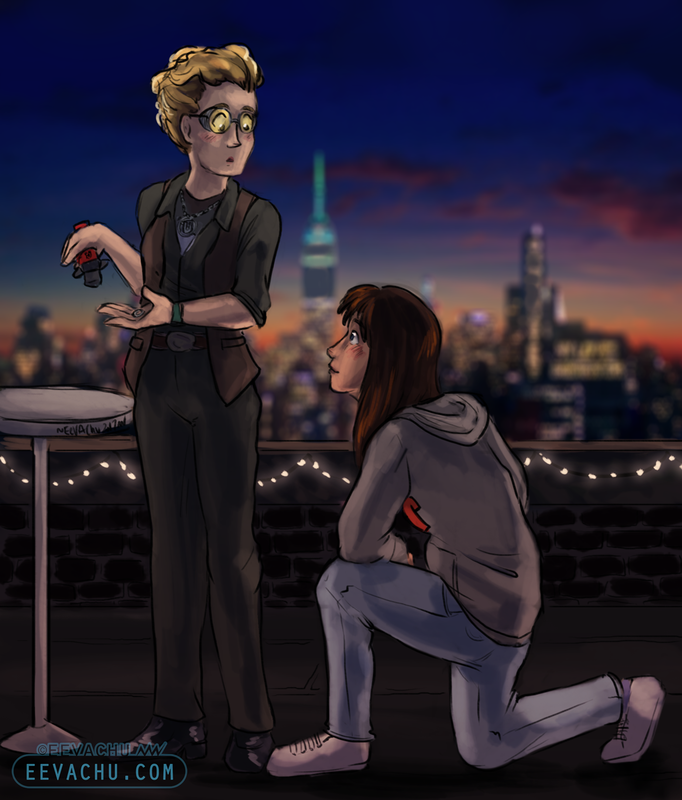 “P-propose-” Holtz presses a finger against Abby’s lips to shush her. Holtz looks around again to make sure the coast is clear. Holtz eyes her suspiciously for a long moment. Abby is sure that her cover is blown. Her salvation comes in the form of Patty choosing that moment to stroll in with lunch. Blessed Patty shakes a paper bag enticingly at Holtz, like one would a bag of treats to a cat. Holtz is off of Abby in an instant. She grabs the bag and holds it to her chest and launches into, “PattyPattyPatty! How would you propose to Erin? Holtz glares. She reaches into the bag grabbing the sandwich Patty had brought back for her and crunching into it angrily. She skulks away, nearly running headfirst into Kevin, who’d come in with the rest of lunch with his dog, Mike Hat. Well, in actuality, Mike Hat had the rest of lunch in the side saddle bags they’d outfitted him with and was walking Kevin back by his leash. “How would you propose to a girl?” Holtz asks, eyes frantically hopeful, smile a bit too bright. “Marriage, dude,” Holtz manages through gritted teeth. “Ah! I wouldn’t. I don’t like girls,” Kevin says and walks away, satisfied with a job well done. Holtz drags her fingers down her face and suppresses a scream. “Oh Mike doesn’t date. He’s a real dog,” Kevin interprets. Holtz gets to her feet, turns silently, throws down the remains of her sandwich, and walks up to the roof. From inside the firehouse, they can hear Holtz’ screams of frustration roar out into the New York sky. At least Lesbian Drama was entertaining, Abby thought. “So uh… where to, gorgeous?” Holtz swings her’s and Erin’s entwined hands back and forth as they walk out the front of the firehouse on a beautiful Friday night. “I had a craving for Chinese, if that’s okay?” Erin suggests. A short walk later, they’re at the doors of the very familiar Chinese Restaurant. Benny is lounging around the front table, apparently playing double duty while waiting on a delivery and seating people. “Hi Erin!” He chimes back and stands up straighter. “Hello, Benjamin,” Holtz says almost haughtily. Holtz and Benny have a tense relationship now that Erin, whom he had taken a liking to, is dating Holtz. Holtz was more annoyed that they’d stopped getting free egg rolls than anything. “Your table is ready that way,” Benny points over to the stairs. “Thank you, Benny,” Erin says before pulling Holtz along up the stairs. Holtz looks back perplexed. “Since when is he a waiter? And since when is upstairs part of the dining area again?” She asks. Holtz is about to ask what kind of favour, but her brain is too busy trying to process what she’s looking at. Through the familiar doors of their old lab on the second floor lies a fully set candlelit table and little else. Holtz laughs at the piles of takeout bags at the table; because of course it’s takeout, the restaurant didn’t have a real dining room anymore. The room itself is dim, with only the candles and waning light of the sunset coming in through window. Holtz gawks at Erin, who is now biting the inside of her cheek nervously. “You’ll have to wait and see,” Erin winks. Holtz has to clutch her heart, utterly struck with affection at the gesture. Holtz delicately places herself down in the chair and bats her eyelashes. “And they say chivalry is dead,” she snarks. Erin takes a seat opposite of her, rolling her eyes. “Don’t sass me, just help me find where Benny put the sodas. I put a lot of effort into this,” Erin says as she tries to tear into the plastic bags. Erin ducks her head and blushes. “Okay, let’s get these open!” Holtz laughs. After a couple fruitless attempts to open the bags in a civilized manner, Erin takes drastic measures. “Oh to hell with these,” Erin grumbles as she pulls out her Swiss Army knife from her pocket. Holtz watches her fiddle with it, and the air is suddenly filled with The Rhythm of the Night. Erin had apparently set up speakers somewhere in the room. “Oh shoot,” Erin stops walking abruptly. They’d finished dinner and decided a long walk home would be best, after how many spring rolls Holtz had just inhaled. “What’d you forget?” Holtz eyes her suspiciously. “Um… may or may not have something to do with your anniversary gift,” says Erin slyly. Holtz takes off like a shot, pulling Erin by the hand behind her. When they walk into the firehouse, Holtz is surprised to find the lights still on and Abby and Patty still at their desks. “What are you guys doing here?” Holtz asks. “Uh huh…” Holtz is unconvinced. Holtz shoots her two friends a look as she lets Erin drag her away. “Where did you say you put it?” Holtz scrunches up her forehead as she follows Erin up the stairs. She still has yet to let go of Erin’s hand. “I hid it up on the roof,” Erin smirks. “Now, close your eyes, so you don’t see what it is. And no peeking,” Erin lets go of her hand as she opens the door. “Scouts’ honour,” Holtz says as she closes her eyes and draws an X across her heart. However, her fingers are crossed on the hand she’s holding behind her back. Then she just has to stare. All about the roof are strings of fairy lights, soft music plays above the din of New York, and in the centre is a white table with a small box on top. Holtz turns to look wide-eyed at Erin, “How..?” Is all she can manage to articulate. “Abby and Patty set it up while we were at dinner. Your present is in the table,” Erin smiles. Holtz kisses her cheek then scrambles to the table. On closer inspection, it’s a box for a Swiss Army Knife. She holds the box up to Erin, it’s a bit lighter than she expects. Holtz rolls her eyes as she opens the box, upending its contents into her palm. To her surprise, it’s not a knife that falls out, but a single silver ring. Holtz forgets how to breathe. Holtz looks down at Erin, who is kneeling in front of her, on one knee. “You just- oh my god!” Holtz looks frantically between Erin and the ring in her own hand. Smooth silver with a ruby flanked by a yellow diamond on either side embedded into the band, she finally comprehends. She can see an inscription on the inside and she’s sure it’s very touching, but it’s getting a bit hard to read between the tears forming in her eyes. “Holtz, um… hanging here,” Erin chuckles probably a little more manically than intended. “Oh. Right. Yes! Yes, more than anything!” Holtz laughs as she flings her arms around and then tackles Erin to the ground. She peppers Erin’s face with kisses in between delighted giggles. “Put it on, I want to make sure it fits,” Erin says still breathless. It turns out, it does. Holtz looks down from where she’s technically straddling Erin, who’s managed to prop herself up on her elbows. She can’t resist kissing her. Erin lets out a soft little relieved sigh. “Why?” Erin’s eyes go wide in panic. From the inside pocket of her coat, Holtz produces a small box. She flips it open and Erin laughs in absolute disbelief. “Hand please,” she sing songs. Erin holds up her left hand and a diamond ring is slipped onto her finger. Holtz kisses her knuckles, as Erin stares at it. Erin laughs and pulls her down for a kiss. Holtz is about to deepen the kiss, but she hears the roof’s door creak. “See, man. I told you they’d be getting busy,” Patty whispers not at all quietly. “We aren’t getting busy,” Erin calls. “Yet,” Holtz whispers huskily in her ear, sending a shiver up her spine. “Erin’s pregnant! I’m the father!” Holtz shouts and falls backwards onto the concrete and off of Erin. She does and they do. There’s a lot of jumping and yelling and hugging, especially after Erin very smugly holds out her own left hand. “Hey!” Abby stops jumping up and down with Erin and objects, affronted. They all laugh at the ridiculousness of that.